Crocodiles may be one of the deadliest hunters in the animal kingdom, but in a small village in Burkina Faso it is not unusual to see someone sitting atop one of the fearsome reptiles. People in Bazoule, around 30 kilometres (20 miles) from the capital Ouagadougou, share their pond with more than 100 of the razor-toothed creatures. 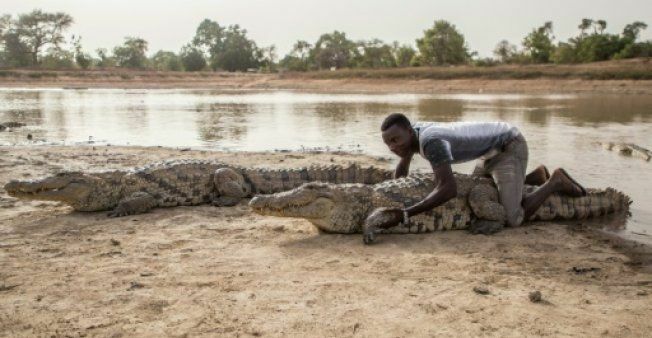 "We got used to the crocodiles when we were young, swimming in the water with them and all that," said Pierre Kabore, just a few metres (yards) away from a crocodile feasting on chicken provided by the village. "Now we can always approach them and sit on them -- and if you have the courage, you can lie on them too. There's no problem, they are sacred crocodiles. They don't do anything to anyone." According to local legend, the startling relationship with the predators dates back to at least the 15th century. The village was in the grip of an agonising drought until the crocodiles led women to a hidden pond where the population could slake their thirst. "The villagers organised a party to celebrate and thank the reptiles," Kabore said. A celebration known as Koom Lakre is still held every year during which villagers make sacrifices and ask the animals to grant their wishes of health, prosperity and a good harvest. Far from being considered a threat, the crocodiles are deemed to have a mystical connection with Bazoule. "Crocodiles are represented as the soul of our ancestors and if one of them dies, they are buried and even given a funeral as if they were human," said Kabore. "When a misfortune is about to happen in the village, they cry out. Elders are charged with interpreting the cries, and then make wishes to ward off bad luck." The unusual contact between man and croc has drawn disbelieving tourists to the village to see for themselves. On their arrival, travellers can buy a chicken which is hung on a stick by a guide and used to entice the crocodiles out of the pond so that visitors can pose with the creatures. "It was nice to watch from a distance but sitting on one was a bit freaky," said Thomas Baspin, a young Frenchman who came to visit his grandparents in Burkina Faso. "I'm glad I did it -- but I'm also glad it's over!" he quipped. Ouagadougou has come under attack three times, most recently in March, when jihadists attacked the military headquarters and French embassy. "We could have more than 10,000 visitors per year but at the moment, there's no more than 4,000 or 5,000," said Raphael Kabore, one of the guides. Global warming is also believed to be having an impact. Rainfall levels are down each year, and the famous pond that is the crocodiles' home is shrinking. When it disappears, will the reptiles once more guide their human friends to a new watery home?